Put in is at the Henry County (Va) access on Marrowbone Creek just below Eggleston Falls (great Class II white water). 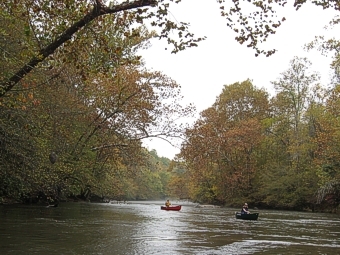 As you start down the river, the Gravely Nature Preserve is on river right. The high rocky slopes are lovely all year with mountain laurel and rhododendron. About 1 .5 miles down river Leatherwood Creek enters from river left. Near here is where Patrick Henry had his plantation "Leatherwood". The take out is at the Mitchell road bridge access on river left.